March 13, 2014, 2:35 PM · For someone like American violinist Stephen Waarts, who handles competitions with so much grace, is it possible that competitions are actually…fun? "I wouldn't say competitions are 'fun,'" said Stephen, laughing, as we spoke in Austin at the home of his host family the morning after his winning performance at the Menuhin Competition. "But they give great opportunities. For example, I get to play with the Cleveland Orchestra today, which is awesome. And recently I did the (2013) Montreal (International Musical) Competition, where I worked with Maxim Vengerov, which was also great." Stephen won First prize, the Bach prize and the Composer prize in the Senior division of the 2014 Menuhin Competition earlier this month. Indeed, despite his rather mellow demeanor, despite that he's still just 17, Stephen has been on a serious fast track, and not just with the violin. For example, he graduated from high school at age 14, showing a special propensity for math and winning a number of national math awards. Musically, he also graduated from the San Francisco Conservatory Preparatory at age 14 and is currently working on his bachelor of music at Curtis Institute of Music in Philadelphia. His repertoire is already vast, his performances have spanned the globe, and his awards are stacking up. At this point, he has more than 35 violin concertos in his fingers, including challenging ones such as Paganini Concertos No. 1 and 2, the Berg Concerto, Ernst Concerto, and Wieniawski Concerto No. 1. Besides playing with the Cleveland Orchestra at the conclusion of the Menuhin, he has played dozens of concerts in his native California and given performances at Carnegie Hall and the Kennedy Center. He's traveled abroad to play in Canada, Germany, Spain, Norway, and Russia. He's done well in other international violin competitions: he won First prize at the 2013 Young Concert Artists International Auditions, Second prize at the 2013 Montreal International Musical Competition, Third prize at the 2011 Sarasate Competition, Second prize in the 2010 Menuhin Competition-Junior Section, and First prize at the 2010 Spohr Competition-Junior Section. 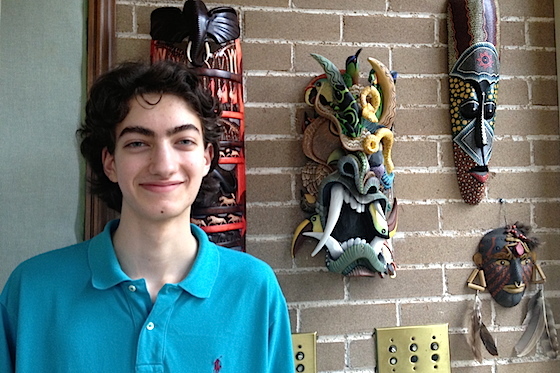 Stephen was born in 1996 in Fremont, Calif. (near San Francisco) to Orli and Robert Waarts, both natives of Holland. It was his twin brother, Michael, who first took an interest in the violin. "I heard the concert at my elementary school, which was a private school," he said, "and my brother and I -- mostly my brother, actually -- wanted to start playing. So we both started playing. I continued, and he stopped maybe four or five years later." Stephen started in a Suzuki violin program with Krishnabai Lewis; "I was five and a half when I started, and I think I got to Book 4 or 5 and then switched teachers. But I went to at least one Suzuki camp, which was fun," he said. He continued lessons with Jenny Rudin, then with Li Lin of the San Francisco Conservatory, where he also studied musicianship and composition, often writing his own cadenzas for concertos. At Curtis, he currently studies with Aaron Rosand. He also plays the piano and likes to paint. Stephen actually played his first competition when he was seven, performing the Kabalevsky Concerto. "That was a small local competition. My teacher wanted me to do it, and it was fun, so I did it," he said. He actually did just call a competition "fun." "It's also a good motivator, to prepare a program and have it all done and ready, and to get feedback," he said. And then there are those opportunities, like playing with the Cleveland Orchestra, and working with conductor/violinist Maxim Vengerov last year at the Montreal competition. What was that like? "It was great; (Vengerov) was really supportive, and a fun guy," Stephen said. "I really enjoyed it. I don't think I felt uncomfortable at all with him." How does one cope with the stress and sheer physical exertion that an international competition demands? How would he advise younger musicians than himself? "Don't look at it as a competition - I mean everybody says this - but just look at it as concert that you have to be really well-prepared for, and just have fun," he said. "I didn't really look at even Menuhin as a competition, when I was playing. I just thought to do my best and not worry about anybody else." Some of the things he does: "Before any concert, maybe the week before, I like to run the pieces at least once every day, so you get the feeling of running it through. Sometimes I'll even record myself and listen back, and that's really helpful. And slow practice, a lot." Stephen played Prokofiev's Violin Concerto No. 2 for the Finals in the Menuhin Competition. How long was that in the works? "The Prokofiev, I learned this summer," he said. "I always like to cycle through pieces, to both work on a piece and then take a break from it, and then work on it again. I think it gives you a new perspective, and you also feel more comfortable. So I studied (the Prokofiev) over the summer, then I stopped it in August, after I did the audition tape for Menuhin. Then I took it back in October, for an audition in November. Then after that, I stopped it until the middle of January and then I took it back." Stephen said that his favorite violin concerto was probably the Brahms, but recently he enjoyed playing the Bartok Solo Sonata. "And I've been wanting to play the Britten Concerto for a long time, so maybe I'll do that next!" What else is next? More competitions? "No, not right now," he said. "I have a concert in two weeks, and that's my main thing after today. After that, I think I'm just going to spend the rest of this school year working on pieces with my teacher that I haven't played much for him before." Unfortunately, Stephen's performance of the Prokofiev Concerto No. 2 was not recorded, but here are his performances for the rest of the Menuhin Competition. Enjoy! Stephen is a terrific player and person and I certainly wish him the very best for what is sure to be a very bright future. March 14, 2014 at 03:13 AM · I believe this young man is quite a rare violinist. I think you see someone like this once in twenty years. The next Heifetz -- who can say? But Mutter, Bell, Grumiaux, even Menuhin himself -- Waarts will reach this level, and with good management, that right soon. Mr. Waarts's paintings seem rather routine and unremarkable. But it's rather hard to be good at everything. March 14, 2014 at 06:21 AM · Paul, I'd like to see your paintings. From when you were 17 or younger. March 14, 2014 at 01:49 PM · I have no skill at painting or drawing whatsoever. Nor have I much talent on the violin or piano. Fortunately I am reasonably good at organic chemistry. Perhaps I should not have been harsh; there is some skill evident but the choice of subject matter and the use of space and color are not interesting. There are young people who exhibit profound talent in the visual arts including drawing and painting at very young ages, just as Waarts exhibits such unbelievable talent on the violin. Many years ago I read an article about a Japanese boy of 4 or 5 years who produced truly stunning watercolors -- images of beauty and originality. Rarer still is the person who can do both. Julia Fischer was amazing on both the violin and the piano. That's not quite the same, but it's sufficient reason for awe beyond what one would normally feel if she could play only only one of those instruments as well. I guess I wonder why Waarts would have a section on his web site to showcase such work that is not anywhere near his musical capability -- perhaps just to demonstrate that he does something besides practice. Maybe that also was the point of bringing it up in your interview. The other distinct possibility is that I'm wrong. Maybe these are masterworks and I just don't have any eye, and in reality Waarts is more than the next Heifetz, maybe also the next Leonardo. 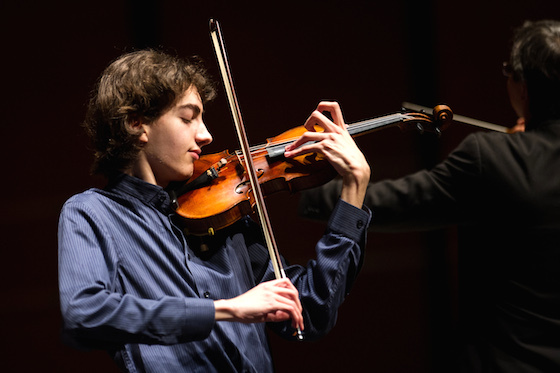 Even though Waarts is only 17, as the winner of such a prestigious competition he is now a public figure, and he might as well get used to reading comments that are not all about his violin playing. Hilary Hahn (just to name one obvious example) has dealt with plenty of that, and Waarts will have to manage it too. As for me, I cannot wait to get my hands on his first recordings. I'm sure they will be brilliant. I hope he will make videos too because his stage presence is so calm and humble, and yet he projects the great majesty of the violin to his audience as few others can. March 14, 2014 at 07:59 PM · Stephen plays a 1868 Vuillaume, which he owns. March 18, 2014 at 12:04 PM · His playing is amazing and powerful! He also seems like such a down to earth guy, humble and calm. I really like it. I don't see any problem with him showcasing his paintings - if he likes to paint, and wants to have a gallery on his website, what's wrong with that? He does not have to be a genius in everything he does. It does not mean it can't be shown or that it doesn't have any value. If we all had to be geniuses in everything, then I think 99,99% people should stop playing the violin.